The event is inspired by the 2016 Summer Olympic Games in Rio de Janeiro, and it allows players to throw the Springfield Games in their towns. EA Mobile released a new content update in The Simpsons: Tapped Out on mobile. The event is inspired by the 2016 Summer Olympic Games in Rio de Janeiro, and it allows players to throw the Springfield Games in their towns. In this event, players can assign citizens to complete special tasks in order to earn Participation Ribbons. 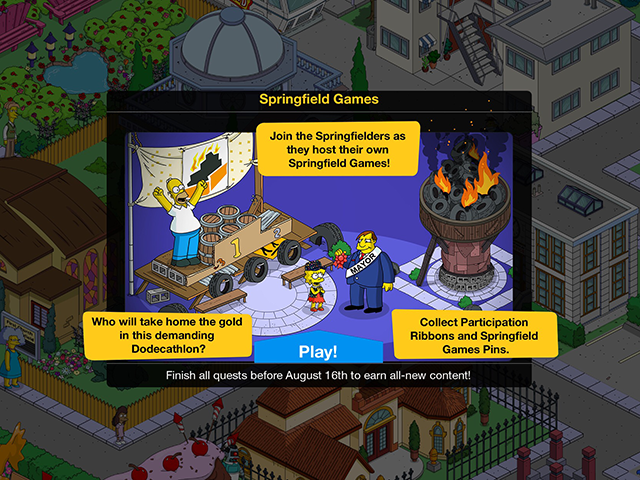 Users can earn six different prizes during this event, including the Springfield Games Cauldron and Springfield Games Podium decorations. In addition, players can purchase sports-themed items in the game’s store, including a Half-Pipe, which generations Participation Ribbons. The Half-Pipe can be purchased for 100 Donuts. Other items include a Country Flag bundle containing 30 country flags (50 Donuts), a Sportacus building (85 Donuts) and Springy, the Springfield Games mascot (60 Donuts). The Simpsons: Tapped Out is available to download for free on the iTunes App Store, Google Play and the Amazon Appstore. The game’s Olympics-themed quests and prizes will be available until Aug. 16.